We are working to improve access to community learning for adults, bringing new ‘local’ learning opportunities to people whatever their circumstances. We are able to do this by delivering learning in local venues but also by establishing a focal point for learning within particular communities. One example of this is that we have, with the support of Surrey County Council’s Travel SMART project, Guildford Borough Council, Guildford College, surveyors Tuffin Ferraby Taylor and Community Foundation Surrey, we have refurbished a property and garden which is now a community classroom and centre for volunteering. We focus our resources on those are often least likely to participate, including those living in rural areas (for example Tandridge and Dorking) and people on low incomes with low skills. Courses cover a wide range of local needs from confidence building to starting a soft landscaping business. Some lead to qualifications and we provide certificates to celebrate the joy which comes with achievement. But where partner organisations and agencies are better able to provide for particular needs we also help learners to enrol on courses with others. The impact of community learning on individuals, families and communities is captured through the many case studies and instances of learners improving their personal circumstances through gaining confidence, new skills, a new sense of purpose, independent living, employment and sometimes self-employment. Through delivering the Learn My Way programme we have been able to offer opportunities across the county to improve digital and financial literacy skills. 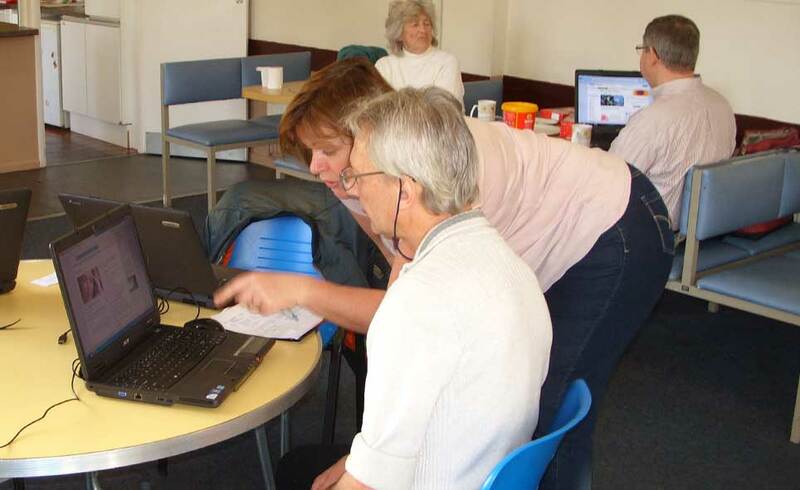 Under our BIS funded Project, TRANSFORM IT – Digital Inclusion for Surrey Communities, we developed the capacity to transform the way learning is delivered within communities. We are building on this by providing courses to provide the skills essential to those re-entering employment. People are resilient and when given the chance reluctant learners become enthusiastic learners. On completing a City & Guilds qualification one delighted learner proudly and confidently declared that they had never achieve 75% in anything. With sustained support there can be lasting change. Those employed as City & Guilds trainers and assessors were once volunteer trainees themselves. They now teach others and are involved in developing the enterprise. Community members who are successful become examples for others. One long term unemployed mum explains to others how she gained employment through establishing her own mobile dog working service with new van and livery. Small steps can lead to big changes. A learner at a homeless hostel who attended a confidence building workshop, an internet awareness course and a healthy eating course delivered by a Jamie Oliver Chef is now in her own flat and living independently. Within some of the communities in which we are active we are able to promote volunteering, for example within our social enterprise projects. These community-based projects provide the time and space needed for improving confidence. This often results in individuals becoming motivated to acquire new skills and to follow options they had not previously considered. Jamie Oliver’s chefs have provided lessons on Healthy Eating to those seeking independent living. Contributing to local community district and borough plans helps to pool resources and leads to sustainability. Our community-based social enterprise activities, for example are embedded within these plans. Meeting with community representatives, local volunteers and those who have an interest in promoting local learning helps us to confirm and respond to local needs and wants.